1: Do thinner or thicker BATTER heads cause more, or less unwanted overtones (the after ring that we try to tune out/tame or muffle completely)? 2: Do Thinner or thicker RESONANT heads cause more, or less overtones? 3: What combo of batter and reso thickness is best to prevent over tones? 4: How do double ply heads vs single, apply to the above? Can someone give me (and anyone else who is in my position) a definitive guide to this? You really can't make hard and fast rules about overtones. What overtones are present, and to what extent, depends on much more than just head thickness and number of plies. The overall tension of the heads (high, medium, low), how they're tuned in relation to each other (same pitch, certain interval), how hard they're struck, the design of the bearing edge, the type of hoop, the dimensions of the drum, the shell's material and design, etc., all affect the presence of overtones. If you want to reduce overtones, at the lower tunings commonly found in rock, then the trick is to get the top and bottom heads cooperating so that they produce a strong fundamental note. 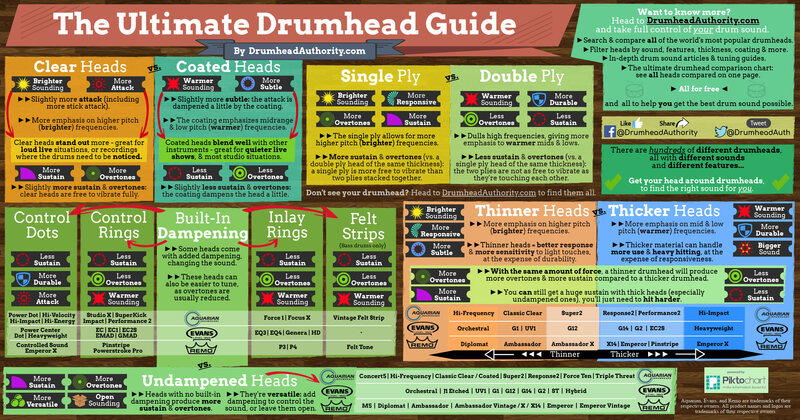 IMHO, the type of drum head is less important than the tuning relationship between top and bottom heads. Tuned a certain way, double ply heads can produce more overtones than single ply, and vice versa. And if you find it difficult to judge the pitch of a drum head, and their interval relationship, by ear (as many drummers do), invest in a Tune Bot. I think that tuning is a critical aspect when it comes to limiting unwanted overtones. There's also the aspect of the bearing edge - sometimes it's difficult to get a particular drum tuned up because the edge isn't true, or the drum isn't round. Another thing that affects the overtone is the tuning relationship between the batter and reso head. Each individual head can be tuned well to itself, but if the interval between the two heads is bad, it will cause ugly overtones too. With that in mind, I'll echo what brentcn said - invest in a Tune Bot. My drums (really just my toms - I don't really use it for snare or kick) have been very consistent since I got mine because I use the recommended tuning/settings for the batter and reso heads, which insures a proper interval between the two, and that goes a long way toward eliminating those overtones. Also, in my somewhat limited experience, it seems that coated heads, and heads with a built-in dampening ring of some kind don't ring quite as much, and that helps to reduce some of the higher frequencies that help to create those overtones. I chased this bunny for several years in an effort to find the sound I like. First off, the drums can be separated into snare, bass, and toms. Each of these have different batter/reso requirements. For the great articulation and brightness, a single ply batter over a 300mil reso works very well. The 200mil reso reduces fullness in the drum’s sound, the 500mil reso mutes the wires too much (they don’t respond well). The heavier the batter head, the lower the harmonic overtones. This eliminates brightness of the snare, and the drum will lose its cut. A jazz bass drum is tuned very differently than a rock or country music bass drum. I’ve explored rock & funk. Funk needs a tighter sound; a very fast punch with very short decay. Everything I’ve tried has brought me to a single ply head with a damping ring and tiny vent holes around the perimeter (old-style EQ4). This is tuned slightly above JAW (just above wrinkle). I use an EMAD ported reso with a dampening ring around the perimeter. Using a couple pillows inside reduces resonance more. I found that heavier batter heads lose the “snap” of the beater on the head (I use a wood beater, not felt). I’ve tried Evans Reso 7 and Genera (10mil). The Reso 7 lost some low end tone. After one week I replaced them with Genera. I’ve tried clear G1, G14, G2, EC1, EC2 all tuned for maximum resonance. I’ll use Moon Gel or tape to shorten the decay. this way I can keep the tone of my toms consistent. Going from G1 to G2 loses the brightness of the stick attack on the head, reduces high frequency harmonics and this, in turn, reveals more lower tones. The EC (Edge Control) series is supposed to reduce overtones but neither type (1-ply or 2) produced a noticeable difference for me, and I prefer to manipulate my sound with gel or tape. I tune my toms for max resonance, but some guys want a dead, dull thump with a lower or higher tone (e.g., Dave Grohl in Nirvana). If this is the desired sound, a coated head might work best. I’ve not experimented enough with shell thickness to know how it plays into the tone, decay & harmonics. I had a Sonor birch kit for about 10 years and loved the floor toms but never liked the tone/decay of the mounted toms. I agree with what others here have said. But I generally get more overtones from thinner batter heads. I use coated 10 mil batter heads on my snare drums; to provide the most open and loudest sound. If the overtones are excessive I put a little piece of Gaffers Tape on the corner of the head. Usually by the second set of a live performance, the band is louder (those darn deaf guitar players). At that point I remove the tape. Thanks for the replies guys, some great tips and info. i realise there is a whole host of other variables to take into account, but just wanted some general ideas - based on everything else being the same. Do Tune Bots work really well? Very very cool post - this is kind of what I've noticed anecdotally, but you've really put in the time and effort to dial it in and figure out just what affects what. It also sounds like you and I have similar preferences for how we like drums to sound. Would any of you agree with this chart? Grohl used a Tama bell brass snare (at least from various videos I've seen). It was one of the loudest drums at the time. He tuned it very low and beat the crap out of it. The guy didn't go for tone like, say, Weckl does. If you're after that old Nirvana tone, find a bell brass snare like this one, put a coated G2 head on the batter and start fussing. A big difference between drums and other instruments is the cost of experimenting with difference heads. You can buy them, but when you try them you cannot return them. A 4-tom experiment with just the batter heads is gonna run ~$50. They do when the head & drum resonate. When the drum is tuned flabby, they aren't as accurate. Thanks, trickg. I don't like a choked sound, but have been known to put tape all over the reso head to kill resonance. Heads with unequal tension at the rods= whining. Loosening one rod=old timers’ lower-the-pitch trick for jazz, not for rock style Tom pounding. Go back to Gaddsen(?) tuning videos to see the cure for unequal tuning and cross patterns for tuning different sized toms.